The University Board of Trustees gave final approval Thursday, June 5 for the University Medical Center’s New Hospital Pavilion—a 21st-century technological and architectural tour de force, designed to accelerate medical progress and leverage the close collaboration between the University’s world-class clinicians and researchers for the benefit of patients. The medical center board approved the project Wednesday, May 28. The futuristic, $700 million, 10-story, 1.2 million-square-foot New Hospital Pavilion, designed by renowned architect Rafael Viñoly, provides a high-technology facility that combines the optimal setting for patient care and collaborative clinical research with the flexibility to adapt to and drive forward rapid changes sweeping through medicine. 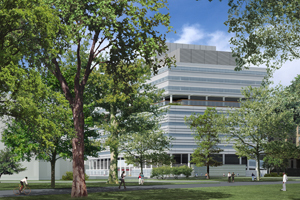 The Pavilion will provide a new home for the medical center’s most distinguished clinical programs, those that provide complex specialty care with a focus on cancer, gastrointestinal disease, neuroscience, advanced surgery and high-technology medical imaging. “The New Hospital Pavilion is a substantial investment that represents our commitment to biomedicine and to the delivery of complex clinical health care informed by the research of our faculty,” said President Zimmer. Engineered to link the forefront of medicine with the University’s agenda-setting science and to provide the most innovative care for patients facing the most challenging illnesses, the New Hospital Pavilion will serve as the new “core” of the medical center campus. It will connect to both the University Comer Children’s Hospital and the Duchossois Center for Advanced Medicine. It will be adjacent to two new, cutting-edge research facilities: the 430,000 square-foot Gordon Center for Integrative Science, and the 330,000 square-foot, 12-story Knapp Center for Biomedical Discovery, scheduled to open in 2009. The New Hospital Pavilion will occupy the north end of two city blocks, extending 570 feet along the south side of 57th Street from Cottage Grove Avenue, over Maryland Avenue to Drexel Avenue. Each floor will provide more than 100,000 square feet of space, more than 1.5 football fields—including the end zones. The Pavilion will contain 240 private inpatient and intensive care beds, 24 state-of-the-art operating rooms, 12 rooms for gastrointestinal and pulmonary procedures, seven interventional radiology suites, and advanced diagnostic tools, including high-resolution high-speed MRI and CT scanners. Construction will begin in 2009, and the building will open in 2012. Rafael Viñoly Architects of New York and London, working with health care facility specialists Cannon Design of Grand Island, N.Y., developed the design. Viñoly designed the University’s award-winning Charles M. Harper Center for the Graduate School of Business. The building’s innovative and efficient design will foster collaboration and interaction among clinicians while providing a haven for patients and families dealing with complex illness. It will be spacious, easy to navigate and filled with natural light. The architects created that flexibility by basing the entire structure on an innovative grid system—a matrix of modular cubes, each one 31.5 feet across and 18 feet high. The repeating modules, 102 on each floor, can be reconfigured as needed to accommodate a wide range of purposes, from inpatient beds to radiology suites to operating rooms, without changing the basic frame of the building. Playing off the traditional courtyard layout of much of the University, the design includes a Sky Lobby on the seventh floor, “effectively lifting the social, contemplative, outdoor space of the campus quad into the air,” according to Viñoly. The Sky Lobby, an elevated public space that “breaks the building’s mass into two components,” will contain central reception, family waiting areas, a chapel, gift shop, dining areas and other public spaces. Its floor-to-ceiling glass walls will provide expansive views of the campus and Lake Michigan to the east, Washington Park to the west, and the downtown Chicago skyline to the north. The top three floors will each contain 80 private patient rooms, including 24 intensive-care beds. The sixth floor will house 24 operating rooms, plus preoperative and recovery areas. 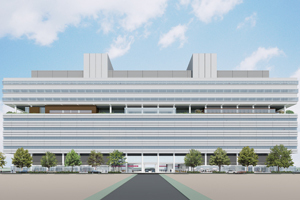 The fifth floor will be devoted to diagnostic imaging and procedure areas, including interventional radiology, GI procedures, pulmonary/bronchoscopy areas, cardiac electrophysiology, plus patient preparatory and recovery areas. The third and fourth floors will initially be left as shell space, providing expansion room for developing programs. Retail space, including a café, at the building’s ground level will enhance the streetscape and be open to the public. Maryland Avenue will pass through the building at ground level, serving as a convenient drop-off point. A green roof will top the building. The University Medical Center makes participation by minority- and women-owned businesses a priority in all construction and renovation projects and has received multiple awards from the Chicago Union League, Chicago United, Black Contractors United and others for its success in these efforts—an approach that is continuing strongly with the New Hospital Pavilion project. This $700 million project will be financed with $500 million from tax-exempt debt, $100 million from gifts, and $100 million from cash and investments.